Traditionally, how many Indian SAAS companies have managed to become platforms so far? Very few. Customers needs are changing as they seek more flexibility to use their data to solve a wide range of business problems. They prefer a suite of tools instead of buying multiple single point products. For SaaS startups, the way to compete with larger incumbents like a salesforce is not by doing another better CRM product, but by being a better AI-enabled platform which is based on interoperability across a gamut of systems. Startups building platforms to enable collaboration with partners and solving a comprehensive customer problem will disrupt those building piecemeal products. This playbook will help product to platform thinkers develop an effective journey through this transformation. If you are a SaaS startup that is ready to embark or already started on the platform approach, this playbookRT will be a great forum for sharing & learning from our Mavens and peers on the challenges and focus areas. There’s been a significant difference in the way we build our product now. We have unlocked a lot of value by converting ourselves into a platform from being a tool. The platform approach allows us to differentiate use cases from products. The below post is edited from an answer given to ET for this story. This article is 2 yr old. Republished today. The rise of Mobile is a big shift in the way Internet is used, thereby influencing commerce over the Internet. In developed economies it is the desktop based users who have started spending a significant amount of time on mobile. For India specifically, mobile is bringing in lot of first time Internet users. Given that Google Search is not the default starting point on mobile, there is a void waiting to be filled as the platform of the mobile internet. No, Android/iOS is not it. There are 3 services that I believe can be the platform of the mobile internet viz. maps, payments and delivery. Before looking into each of them, the hypothesis here is that the Internet of mobile is no longer about serving information but it is about enabling actions. So what happens to information related stuff? They will move to a Chat like app with a command prompt like interface. It is already happening with Wechat, Line etc. Search would be easier over chat with results showing bite-size info in cards, the blue-link click is only required to dive deeper. Why chat and not current Google search? Because the current Google search is a state-less communication. Two consecutive searches do not relate to each other. The command prompt type interface serving bite-size info will need to be state aware, just like human communication. In the long term, Maps are going to be default page for most of our local needs, like movies, cabs, handyman or anything related to offline commerce. Different reports suggest that about 40-50% of all mobile search is local. Instead of a page with blue links, maps will become our search engine on mobile. China is already seeing this change with Baidu Maps driving all-things-local. Google Maps also recently integrated Uber to show estimated pickup time if you have uber installed (http://blog.uber.com/googlemaps). When you have more than 1 cab app installed, Google Maps will influence which one you choose. In the long run it will also mean that you will not need to install the app but the app will just be backend integrated with Google Maps. Users currently find it easier to search for “Zomato Pizza Hut” on Google and then go to Zomato’s Pizza Hut page, as compared to first going to Zomato.com, and then searching for “Pizza Hut”. In the same way, people will not look for a cab on a map inside Ola or Uber’s app, instead Ola and Uber’s cabs will be visible together on a single instance of Google Map. The future of mobile local search is Apps on Map, and not maps inside apps. Just like now we don’t need to bookmark every restaurant site on the web browser, in future we may not need to install every cab booking app. This is the most important and defensible product of Google in the long term. Individual Apps as an interface is an intermediary stage of the mobile evolution until platform level aggregation and deep integration does not come into action again. We do not see payments as a platform because it is generally not the starting point or in most cases we don’t even realize if it has an interface. It just happens, and that is how it is supposed to be. Apple and Samsung are working towards that. In India, the wallet feature in apps is being accepted. Mobile carriers and large banks are trying to get into the space. Paytm seems to be moving fastest in this space though. There are still licenses to be issued in this space by RBI and rightly so because this space is more about enabling trust and insurance, the core of commerce, than anything else. Indian consumers do not relate to payment systems and insurance directly, but in developed economies one can ask their credit card company for a complete refund if the service by a vendor is not satisfactory. So they not only act as a credit and payment company but also an insurance company. Being on a universal trusted payments platform will mean more business. Micro-transaction will happen over a payments app and each little vendor need not have their own app with payment gateway. I should be able to use a plumber’s service and pay via a payments app that both of us use. Delivery of physical goods is a big platform opportunity. What we generally see as an ecommerce company is a delivery company. A lot of commerce, new and used, B2C and C2C, is being limited by the physical movement of goods. While intercity delivery is controlled by large courier companies, the hyper local delivery of goods is still an unsolved problem. Uber is dominant in this space for people movement and now starting for food but their platform doesn’t yet allow movement of small goods from B2C or C2C. In India, Delyver and Grofers are trying to capture this space. Entering the C2C delivery space will be a big move for them. It’s human delivery network now but from what we see, it will evolve into a drone network. You become what you measure. From my experience working with clients across enterprises and startups, the most common reason for failure and inefficiency is the focus on convenient, but inappropriate, metrics. Your technology doesn’t determine the business you build. Neither does your organizational capability. The metric you optimize for is the single biggest factor that determines which business you end up building. The importance of choosing the right metric is more far-reaching than we often believe. A metric is a bit like a commander’s intent in an army. At battle, there are a lot of variabilities and unexpected contingencies which cannot be pre-planned for. The Commander’s Intent is a simple rule of thumb that helps soldiers take local, individual decisions towards a cohesive, larger goal. Metrics work in much the same manner. Once you set a metric, the entire team organizes its efforts around it, and works relentlessly to optimize the business for that metric. It’s often fancy to have a large dashboard with multiple graphs tracking hundreds of things. But to be truly effective, an organization/team/individual should be solely focused on optimizing for one metric. If you’re asking someone to optimize for more than one metric, you’re setting them up for failure. Often, ratios help capture multiple movements in one metric. Whether you think of the financial ratios that traditional business managers track or the DAU/MAU that app developers relentlessly track today, ratios tend to be important as they explain concentration rather than quantity. This discussion of metrics is especially important in the world of platforms and networked businesses. Platform businesses are a lot more complicated than traditional pipe businesses. Pipes optimize unidirectional flow of value. Hence, metaphorically, releasing bottlenecks at any point should help with the flow. The Core Metrics for pipes, naturally, then, measure smoothness of flow and/or removal of bottlenecks. Inventory turnover is one such metric to check how often the flow of goods/services moves through the pipe. All forms of Output/Input ratios for intermediary teams on the Pipe are, again, checks to understand rate of flow and identify creation of bottlenecks. But this tends to be much more complex in the case of platforms where flows are multi-directional. Moreover, they are interdependent because of network effects. E.g. optimizing activity on the producer side may have unexpected implications on the consumer side. On a dating network, allowing over-access to men may be unattractive for women. Hence, even if you have two different teams optimizing for two different metrics on the producer and consumer side, the activities of one team may adversely impact the pursuits of the other team. How then does one go about deciding on platform metrics? We are in the business of enabling interactions. This is much like the Commander’s Intent I mentioned earlier and has important implications. Irrespective of how big your firm is, how complex the operations are, the goal should always be to optimize the core interaction. From a metrics perspective, this essentially means that the Core Metric that rules everything should measure interactions. If you’re running a platform business, you need to start measuring and optimizing your core interaction. So we get the fact that we need to measure interactions. However, we still need a measure, a number that shows the Core Interaction is working well. As with all metric design, it is still possible to choose the wrong metric despite understanding the importance of measuring the Core Interaction. To design the right metric, let’s revisit what the Core Interaction on a platform actually entails. 1. A platform enables exchange of information, goods/services, money, attention etc. between the producer and consumer. For a visual guide to how this works, check the article here. 2. The exchange of information always occurs on the platform. The other exchanges may or may not occur on it.The exchange of information enables every other exchange to take place. To understand the mechanics of this, refer this article. 3. The exchange of information is the key source of value creation across all platforms and can be visualized as the Core Interaction of the platform. To understand the structure of the Core Interaction in detail, check the article here. Let’s now look at the different types of platforms and tease out relevant key metrics. 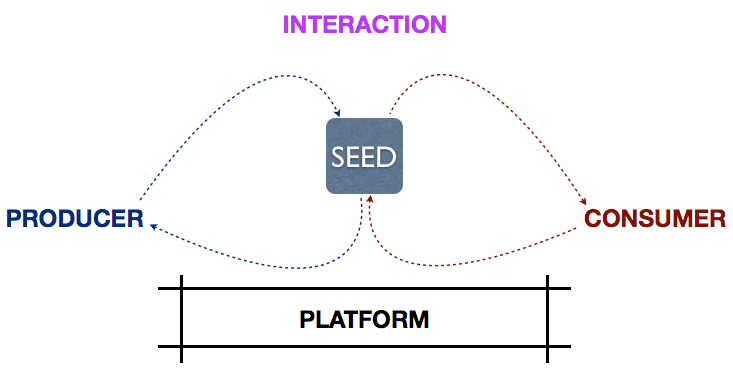 Some platforms capture the transaction between producers and consumers. These platforms typically track actual transactions. Platforms like the Amazon marketplace may measure gross value of transactions. Those like Fiverr (which have fixed value per transaction) may simply measure number of transactions. Airbnb tracks number of nights booked. This is a better indicator of value creation than simply tracking number of transactions. At the same time, it doesn’t care about value of transactions (spare mattress being booked vs. castle) as the goal is simply more value created irrespective of type of customer. Some platforms can track the exchange of goods and services in addition to capturing the exchange of money. ODesk, for example, can track number of hours of work delivered by the freelancer (producer), a key measure of value creation. Clarity.fm can track duration of the consulting call between an expert and the information seeker. Some platforms are unable to capture the transaction, the exchange of money. They create value by allowing producers access to consumers. In these cases, one of the common metrics tracked is the platform’s ability to generate leads. OpenTable specifically tracks reservations. These are not the actual transactions at the dinner table, but serve as a proxy for the value created. Some platforms may track overall/relevant market access. Dating and matrimonial sites often talk about number of women registered as that determines the value that a user can expect to get. One of the key properties of platforms is the fact that external producers can add value. Whether it is new apps on an app store, new videos on YouTube or new pictures on Flickr. In these cases, one is tempted to solely track these co-created Value Units. However, Creation forms only one-third of the Core Interaction. The proof of the pudding, in such cases, lies in repeat Consumption. Some platforms may track the total consumption, some may track the percentage of Value Units that cross a minimum threshold of Consumption. I tend to favor the latter as measuring and increasing the percentage of units that get minimum consumption ensures that the platform focuses on getting more producers who create relevant units that will be consumed. It also ensures that, over time, the feedback loops (in the forms of notifications to producers) will encourage creation of the kinds of units that get greater consumption. Some platforms may create value largely by signaling quality. Reddit is one such example where Curation is more important than Creation or Consumption. Such platforms may track reputation of users and create feedback loops that encourage users to participate often, gain karma and use that to participate further in the curation process. Platforms where the Core Value Units are content e.g. YouTube, Medium, Quora etc., the engagement of Consumer Attention serves as a key metric. Measuring number of videos or articles uploaded or number of videos viewed or articles read is often not enough. These give indications of Creation and Consumption but not of Curation. We need some indicator of quality as well. This is why many such platforms track the percentage of content which gets a minimum engagement. Medium tracks views and reads separately indicating that it requires a minimum commitment from the Consumer to determine quality of the content. 1. Creation is the most common metric tracked. Number of apps, number of videos, number of sellers etc. This is misleading. 2. In the case of Market Attention category platforms, Consumption is the most common metric tracked. This is an improvement but still not a measure of quality. 3. Curation is rarely tracked and is often the most important metric that determines the health of the platform. 4. The measure of transactions that should be tracked varies with type of platform. In some cases, number of transactions may suffice, in other cases, volume of transactions may matter. 5. The metric that best explains interactions will change over the life cycle of the platform and it’s critical to identify points at which these transitions occur. Companies often make the mistake of sticking on with an older metric when their business has scaled. Identifying and vetting the Core Metric at every point is very important. While measuring the platform’s ability to create interactions is important, it is equally important to measure its failure to close interactions. I will explore this further in a subsequent post. On a platform, the Core Metric that rules them all must measure and optimize the Core Interaction. This article was originally published on Sangeet Paul Choudary’s personal blog Platform Thinking – A blog about building early stage ventures from an idea to a business, and mitigating execution risk. You can’t invite people to a party and try to sell them stuff. Pretty much every starry-eyed startup that went after eyeballs gets it by now. Over the last seven years the web has moved away from a consumption medium (think NY times) to a creation-consumption medium (think Twitter, Facebook). But we’ve been very tardy in reshaping business models for this new model of the web. Interestingly, the solution to this monetization problem may lie with a small insignificant key on your keyboard. Read on. Why are we failing at monetization today? Traditional online media worked on a Pipe model, targeted only consumers and got away with monetizing eyeballs. Social media works on the Platform model, supports both creators and consumers, and has tellingly failed with trying the same old monetization strategies. Monetization works by harvesting user intent and serving messages/information relevant to that intent. The better you are at harvesting intent, the more effective your monetization is going to be. Why is this model breaking down? Mining context and intent goes for a toss in the world of social platforms. Users are the new content creators and content isn’t necessarily structured. With the older media model, the content creators (typically the media houses) were creating content to cater to search engines. The content was designed for text mining algorithms right at the point of production. With social media, the creators of content (all of us) don’t care about structure. In fact, online conversations are getting more unstructured by the day. Consequently, mining these conversations for context and intent is a crazy task, riddled with false positives. And false positives always lead to spam. This is why the Hashtag is so important to the future of the web. Engineers would like to be known for the tech innovations that they engineered but Chris Messina will probably go down in history as the guy whose random blog post helped structure a new era of media. In a 2007 post, Messina suggested the use of Hashtags for the first time for Twitter. This week, Facebook rolled out Hashtags. It’s interesting to revisit that original blog post and figure out how Platform Thinking is so rare (and important) and how most of us just prefer to think in Pipes. If you think of media as a Pipe where content creators create stuff and push it out for us to consume, the content creator takes great pains to structure the content. Every piece of content will be carefully drafted in a category, will be peppered with keywords for search engines to gobble and will be structured so that the context can be easily mined. If you look at the proposals from Stephanie and Brian, they advocate the use of pre-defined groups to regulate conversations around certain contexts. This is a typical Pipe Thinking model. Provide the constraints and force the creators to work within those constraints. It works very well when media is created within the boundaries of a firm. When media is created by users, as it is today, one cannot afford to think in terms of constraints anymore. This is where Messina’s advocacy of the Hashtag is so brilliant. If you’re thinking in terms of Platforms, you’d want to make the creation process as easy as possible for users, yet ensure that they leave you with enough hints around intent and context. This is what Flickr did when it allowed users to tag pictures instead of forcing them to fit pictures into pre-defined categories. This is what Messina advocates in this post when he argues against users having to operate within groups and allows users to define context and intent on the fly. Top-down classification and forcing creators to fit within categories or groups is a hangover from Pipe Thinking; an editorial view of the web. A social view of the web requires a more bottom-up approach. If you think of the social web as a flow of information, pre-defined categories and groups limit the channels in which information can flow. Hashtags, instead, allow creation of channels on the fly to suit the needs of the information creator. When the world first saw an explosion of user-generated content, people realized that Google’s keyword and link-driven approach to ranking information wasn’t going to work forever. Semantic search was hailed as the next savior. I have nothing against semantic search. I just believe algorithms are still fairly limited in mining human intent from unstructured conversations. And the web is gradually, but definitively, moving towards unstructured conversations. The solution to mining unstructured information doesn’t lie in creation of more sophisticated algorithms alone. It lies in, first, solving the problem at the point of production and allowing the new creators to easily append some structure to the information. That is exactly what the Hashtag does! If you’re building a platform that enables and promotes unstructured conversations, and you want to go beyond just being a communication tool, to creating a corpus of sticky content, hashtags can help transform unstructured conversations to structure, right at the source. Hashtags are the new keywords, and the key to monetizing social media. Tags are the new categories, hashtags are the new keywords! Why do most social networks never take off? Why are marketplaces such difficult businesses? Why do startups with the best technology fail so often? There are two broad business models: pipes and platforms. You could be running your startup the wrong way if you’re building a platform, but using pipe strategies. More on that soon, but first a few definitions. Pipes have been around us for the last 400 years. They’ve been the dominant model of business. Firms create stuff, push them out and sell them to customers. Value is produced upstream and consumed downstream. There is a linear flow, much like water flowing through a pipe. We see pipes everywhere. Every consumer good that we use essentially comes to us via a pipe. All of manufacturing runs on a pipe model. Television and Radio are pipes spewing out content at us. Our education system is a pipe where teachers push out their ‘knowledge’ to children. Prior to the internet, much of the services industry ran on the pipe model as well. This model was brought over to the internet as well. Blogs run on a pipe model. An ecommerce store like Zappos works as a pipe as well. Single-user SAAS runs on pipe model where the software is created by the business and delivered on a pay-as-you-use model to the consumer. Had the internet not come up, we would never have seen the emergence of platform business models. Unlike pipes, platforms do not just create and push stuff out. They allow users to create and consume value. At the technology layer, external developers can extend platform functionality using APIs. At the business layer, users (producers) can create value on the platform for other users (consumers) to consume. This is a massive shift from any form of business we have ever known in our industrial hangover. TV Channels work on a Pipe model but YouTube works on a Platform model. Encyclopaedia Britannica worked on a Pipe model but Wikipedia has flipped it and built value on a Platform model. Our classrooms still work on a Pipe model but Udemy and Skillshare are turning on the Platform model for education. So why is the distinction important? Platforms are a fundamentally different business model. If you go about building a platform the way you would build a pipe, you are probably setting yourself up for failure. We’ve been building pipes for the last few centuries and we often tend to bring over that execution model to building platforms. The media industry is struggling to come to terms with the fact that the model has shifted. Traditional retail, a pipe, is being disrupted by the rise of marketplaces and in-store technology, which work on the platform model. So how do you avoid this as an entrepreneur? Here’s a quick summary of the ways that these two models of building businesses are different from each other. User acquisition is fairly straightforward for pipes. You get users in and convert them to transact. Much like driving footfalls into a retail store and converting them, online stores also focus on getting users in and converting them. Many platforms launch and follow pipe-tactics like the above. Getting users in, and trying to convert them to certain actions. However, platforms often have no value when the first few users come in. They suffer from a chicken and egg problem, which I talk extensively about on this blog. Users (as producers) typically produce value for other users (consumers). Producers upload photos on Flickr and product listings on eBay, which consumers consume. Hence, without producers there is no value for consumers and without consumers, there is no value for producers. Without solving for these two challenges, driving site traffic or app downloads will not help with user acquisition. Startups often fail when they are actually building platforms but use Pipe Thinking for user acquisition. Pipe Thinking: Optimize conversion funnels to grow. Platform Thinking: Build network effects before you optimize conversions. Creating a pipe is very different from creating a platform. Creating a pipe requires us to build with the consumer in mind. An online travel agent like Kayak.com is a pipe that allows users to consume air lie tickets. All features are built with a view to enable consumers to find and consume airline tickets. In contrast, a platform requires us to build with both producers and consumers in mind. Building YouTube, Dribbble or AirBnB requires us to build tools for producers (e.g. video hosting on YouTube) as well as for consumers (e.g. video viewing, voting etc.). Keeping two separate lenses helps us build out the right features. The use cases for pipes are usually well established. The use cases for platforms, sometimes, emerge through usage. E.g. Twitter developed many use cases over time. It started off as something which allowed you to express yourself within the constraints of 140 characters (hardly useful? ), moved to a platform for sharing and consuming news and content and ultimately created an entirely new model for consuming trending topics. Users often take platforms in surprisingly new directions. There’s only so much that customer development helps your with. Pipe Thinking: Our users interact with software we create. Our product is valuable of itself. Platform Thinking: Our users interact with each other, using software we create. Our product has no value unless users use it. Monetization for a pipe, again, is straightforward. You calculate all the costs of running a unit through a pipe all the way to the end consumer and you ensure that Price = Cost + Desired Margin. This is an over-simplification of the intricate art of pricing, but it captures the fact that the customer is typically the one consuming value created by the business. On a platform business, monetization isn’t quite as straightforward. When producers and consumers transact (e.g. AirBnB, SitterCity, Etsy), one or both sides pays the platform a transaction cut. When producers create content to engage consumers (YouTube), the platform may monetize consumer attention (through advertising). In some cases, platforms may license API usage. This formula works extremely well for ecommerce shops or subscription plays. On platforms, more of a systems view is needed to balance out subsidies and prices, and determine the traction needed on either side for the business model to work. Pipe Thinking: We charge consumers for value we create. Platform Thinking: We’ve got to figure who creates value and who we charge for that. If the internet hadn’t happened, we would still be in a world dominated by pipes. The internet, being a participatory network, is a platform itself and allows any business, building on top of it, to leverage these platform properties. Every business on the internet has some Platform properties. I did mention earlier that blogs, ecommerce stores and single-user SAAS work on pipe models. However, by virtue of the fact that they are internet-enabled, even they have elements that make them platform-like. Blogs allow comments and discussions. The main interaction involves the blogger pushing content to the reader, but secondary interactions (like comments) lend a blog some of the characteristics of platforms. Readers co-create value. Ecommerce sites have reviews created by users, again an ‘intelligent’ platform model. In the future, every company will be a tech company. We already see this change around us as companies move to restructure their business models in a way that uses data to create value. We are moving from linear to networked business models, from dumb pipes to intelligent platforms. All businesses will need to move to this new model at some point, or risk being disrupted by platforms that do. Note: I intend to use some/all of the ideas here as part of an introductory chapter to the book I’m working on and would love to have your feedback and comments.